We love having a little Fill in the Blank fun, and I realized I haven’t filled this category in a while. As much as I love talking about bags, I love hearing what you all think about them as well, and there is no better way to have you sound off than a Fill in the Blank post. Pierre Hardy may not be a brand you immediately think of when thinking of designer handbags, but his designs are quite beautiful. The aesthetic is easily recognizable, and that’s important when it comes to making a name for yourself. Taking on the color blocking trend (do we still call that a trend? 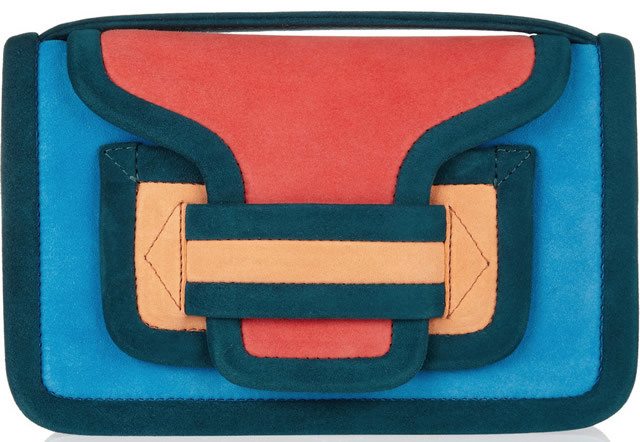 ), the Pierre Hardy Color-Block Suede Bag mixes pop-bright shades of red, orange, teal and blue. As with other Pierre Hardy bags, this one has a modern edge and I can see it working well for winter into spring and summer. Buy via Net-A-Porter for $795. Fill in the blank: The Pierre Hardy Color-block Suede Bag is _______.